A cliché is something that can be a bit boring to some, but is both comforting and easy to connect with for others. 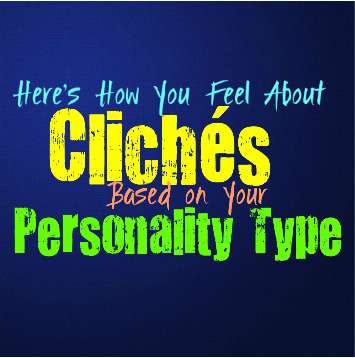 Here is how you often feel about clichés based on your personality type. INFJs can sometimes enjoy certain clichés, especially if they can use them in an ironic manner. Something that has been overused in this way, doesn’t always lack a purpose. INFJs realize that some clichés are simply useful ways of connecting with others and making them feel understood. While INFJs value originality, that doesn’t mean they cannot appreciate the use of a cliché when it conveys a point in an accurate and helpful manner. ENFJs don’t often mind the use of clichés, and might even enjoy them sometimes. Clichés can be comforting for the ENFJ sometimes, and can even help them find ways to connect with others. While they admire the use of originality, that doesn’t mean they can’t enjoy some things that have been a bit overused. They are fully aware that these things are cliché for a reason, often because they are true and have become something people universally known. INFPs do value originality, but they often utilize clichés in the right moments. INFPs are original thinkers but at the same time they can use clichés in certain moments to convey what they want. They even enjoy doing this ironically sometimes, and like being able to see how people will react. INFPs can become annoyed with some clichés though, especially ones that people connect with in a way that seems a bit boring and emotionless. ENFPs don’t often live their lives interested in anything cliché, and are often drawn to originality. They don’t want to overuse expressions that other people use, instead they often want to come up with their own. ENFPs want to feel free to explore themselves without having to constantly look at things from the eyes of someone else. ENFPs might not mind certain clichés, mostly they will like ones that are humorous. While they don’t mind some clichés, others can seem a bit pointless and boring to them. INTJs don’t usually find themselves all that interested in clichés, instead they are more interested in originality. They understand that clichés serve a purpose, and that often they exist because they are overused truths. While they realize this, they can become bored with hearing them all of the time. There is something a bit cheesy about most clichés, and this can be a bit unpleasant for some INTJs to hear all of the time. They would rather focus on speaking from their own minds, instead of using clichés. ENTJs don’t really find themselves all that interested in clichés, and might become annoyed with people who use them often. ENTJs are more interested in efficiency, and will utilize clichés if it helps them convey a point to someone who isn’t quite grasping it. They would often rather speak from their own intellect, rather than using clichés which can feel a bit cheesy to them most of the time. While ENTJs might not mind clichés in the right context, there are other times when they feel a bit exhausting. INTPs might believe that clichés can serve a purpose in certain situations, often to be used in a more ironic sense. They do value originality more than simply looking at overused platitudes, and want to come up with their own ways to express things. INTPs do value the use of clichés sometimes though, especially when they need to connect with someone and these clichés can help them do so in a more understandable way. INTPs simply can become a bit annoyed with people who use them constantly and who value them more than their own thoughts. ENTPs really aren’t cliché people, instead they value originality and uniqueness. They enjoy being able to explore themselves, as well as new things outside of them. ENTPs often want to express themselves and their own thoughts instead of constantly using platitudes that have been constantly expressed. Clichés can be a bit obnoxious and draining for ENTPs, especially when they come from people who use them often and in a very serious manner. ISTJs don’t really mind the use of clichés, especially when they express something true. They don’t become bored with something just because it is overused, instead they want to look at the value and efficiency of it. When they witness a cliché that is expressing something that is true and serves a purpose, they won’t have negative feelings about it. If it is a bit too cheesy then they will become annoyed by it, but they can get past this most of the time. ESTJs don’t often mind clichés, since they can bring them a sense of comfort. They don’t become bored with something simply because it is overused, instead they want to see how efficient it is. If something is efficient and gets the job done properly, they certainly won’t be against it. ESTJs don’t really like clichés that can appear too cheesy, but at the same time they can be helpful in expressing certain things. ISFJs don’t usually mind clichés, since they can bring them a sense of comfort. They enjoy things that they can understand and use to connect with others. ISFJs don’t mind something that seems repetitive, or something that people find to be a bit cheesy. Clichés can being them comfort if it reminds them of a person, or something from the past. ISFJs simply don’t need everything to be new or overly original, they enjoy things that can being them a sense of comfort. ESFJs don’t mind some clichés, especially if they are things that bring them comfort. If the ESFJ has head a statement often from the past, it might be something that puts them at ease. They also realize that some clichés are overused because they express something true and valuable. They don’t need things to constantly be original, and enjoy some statements that can cause them to connect with others. While ESFJs might become tired of constant clichés, they understand that they serve a purpose. ISTPs don’t usually like clichés all that much, and can even find them a bit annoying. When they hear the same statement being overused it often feels worn out and useless to them after a while. Even if the statement expresses something true, the ISTP would likely want to hear it phrased differently. They would rather people speak from their own minds rather than constantly use clichés that they heard elsewhere. ESTPs aren’t usually fans of clichés and can find them a bit obnoxious even. They don’t like statements that are overused and lack a sense of originality. For ESTPs it can become tiresome when people state the same thing over and over again without trying to utilize their own original thought. While some clichés might be amusing to them, most of the time ESTPs find them tired. ISFPs might enjoy some clichés, but often these are ones that speak to them personally. Most of the time ISFPs enjoy original expressions and original thought, instead of those that have been overused. The use of clichés can feel tiresome to the ISFP after a while, especially ones that seem to lack a sense of emotion and true expression. ESFPs might be okay with the occasional cliché, especially if it something they feel emotionally connected to. While they might enjoy clichés from time to time, they often prefer a sense of originality. ESFPs enjoy things that are new and unique, and want to be able to use their own minds and feelings to express themselves. Clichés can feel a bit pointless to them, and they would often rather approach things in their own original way.